IC 410 is a faint and dusty emission nebula of more than 100 light-years across, located near the Flaming Star Nebula (IC 405) in a large star forming (HII) region about 12,000 light-years away from Earth in the northern constellation of Auriga. 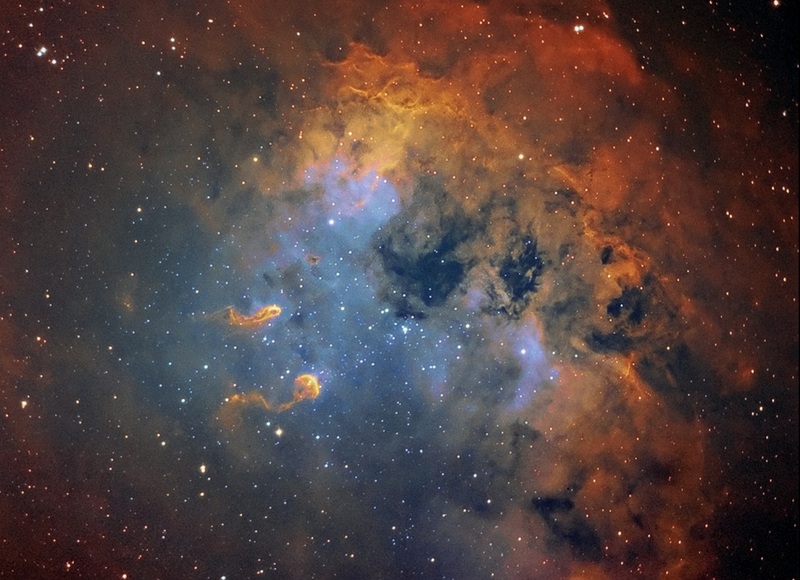 The cloud of glowing gas is sculpted by stellar winds and radiation from the embedded open star cluster catalogued as NGC 1893, which is just about 4 million years old. The massive, hot stars of this cluster are all very young, having only been recently formed from IC 410. The bright stars of this cluster are seen just below the prominent dark dust cloud near picture center.